Jaw Crusher:This series jaw crusher has a feature of large crushing ratio, uniform product granularity, simple construction, reliable operation, easy maintenance, low operating cost. This crusher is widely used in mining, smelting, building materials, roads, railways, water conservancy, chemical industry and many other departments, meanwhile all kinds of materials with compressive strength of less than 320 MPa. Jaw Crusher is mainly used in industrial departments such as metallurgy, mining, chemical, cement, construction, refractory materials and ceramics etc for secondary crushing and fine crushing of various half hard ore and rock. 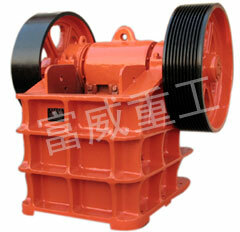 Jaw Crusher mainly suits for breaking various soft and hard ores with compressive strength of less than 300MPa. And the largest lumpiness of the broken materials shall not be larger than that regulated in technical parameters table. 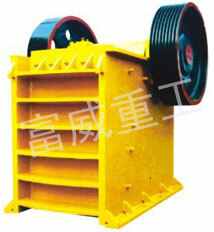 The way of jaw crusher working is bending pressing type. The working principle is: motor drives belt and pulley, make up and down movement through eccentric shaft. When moving jaw ups, the angle between toggle plate and moving jaw becomes larger so as to promote jaw plate to get close to the fixed jaw plate. At the same time materials are crushed or cut pieces to achieve the purpose of crushing. When moving jaw downs, the angle between toggle plate and moving jaw becomes smaller, and the fixed jaw plate leaves the fixed jaw , under the action of bar and spring, ,at this time broken material discharge from the mouth under the crushing chamber. With the continuous rotation of motor, mobile jaw of the crusher makes periodic motion for crushing and discharge materials to achieve mass production.